A few months ago, I decided that I'd well and truly had enough of black hair and after years of damaging it with box dyes booked into the hairdressers to start the process of getting it back to my natural colour. I knew it would end up being a costly process, but weighed up the amount I spend on needlessly dying it myself compared with how much I'll save after I'd had the colour stripped out and decided that it would be well worth it. I've had two sets of balayage dyes in the last eight weeks and as I had a repairing treatment used each time, have noticed minimal damage. That being said, I'm now starting to finally take care of my hair properly and have devised a routine using some newly discovered products. I'm rarely so impressed by a brand that I'd feel confident in using their entire range, but since I first tried out Davines at the start of the year, have been endlessly impressed by how well the products work with my hair. I've been using the OI Shampoo (£16) and OI Conditioner (£17.50) for around a month now, along with the All-in-One Milk (£19). I seriously want to shout it from the rooftops how incredible these products are. Only the tiniest amount of the shampoo is needed to create a soft, silky lather and it does a remarkable job of both cleansing and nourishing the hair. The conditioner has a light yet buttery texture which works beautifully on damaged hair and dry, itchy scalps without leaving any product build up behind. I tend to use the milk as a de-tangler if my hair is misbehaving, and before blow drying. The whole range has a faint masculine, musky yet sweet scent, which I'm completely addicted to. I'm not a fan of the usual sickly, fruity scents of haircare products, so this makes the whole range perfect for me. 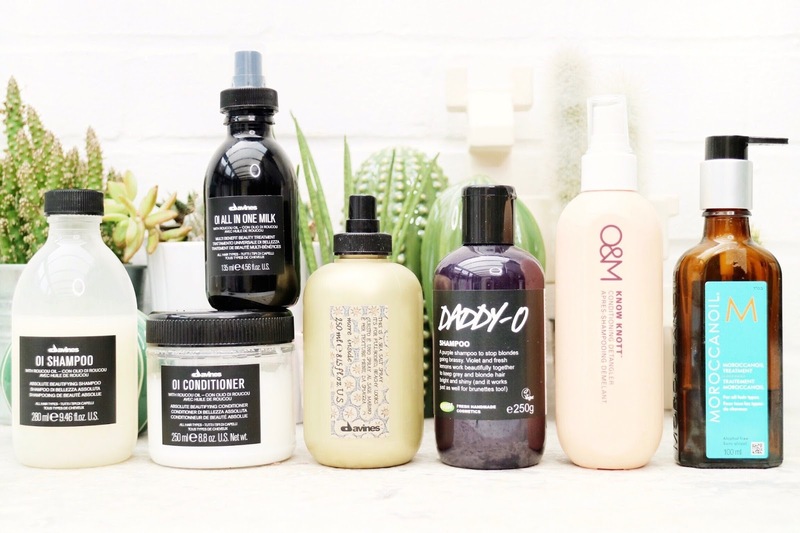 I'm currently eyeing up the 1L supersize bottles of the shampoo and conditioner as both work so well for me that I have no interest in ever trying out anything else! Another favourite Davines product of mine (told you, I'm their biggest fan) is the Sea Salt Spray (£15). I'm super careful when it comes to overloading my hair with product as there is nothing I hate more than the feeling of heavy, weighed down hair. This feels so lightweight, yet adds texture and body and can be used on both wet and dry hair. Yet another get it or regret it. As much as I'm a Davines addict, I couldn't write this post without giving a mention to Lush. Daddy-o (£11.50) is my second favourite shampoo of all time, and is my go-to for countering the brassy tones in my hair whilst leaving it smelling of parma violets. O&M Know Knott (£22) is perhaps the most expensive de-tangler of all time, but if you endlessly struggle with tangles, it's truly well worth considering. Packed with cold pressed Argan and Macadamia oil, it delivers shiny, sleek hair like nothing else. I've been on the same bottle for months and have only just got to the halfway point, which really proves its value for money. Especially considering it's currently down to just £9.25 here! The ends of my hair are forever in need of some loving care and require a little more attention than the rest of my hair. I opt for the Morroconoil Treatment (£25), which is of course a timeless classic. It work wonders at taming frizz and hiding split ends out of sight.